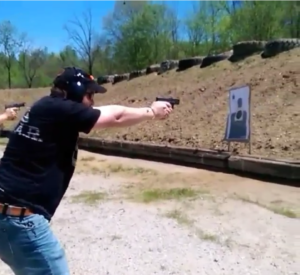 Defensive firearms training is an essential self defense skill in modern America. This course lays the foundation for those skills in the context of a sudden, unexpected attack on you, the responsible concealed carry civilian. Defensive Pistol Level 1 is a course of training designed to help you, as a responsible citizen, be more efficient with a pistol in the context of everyday, civilian self defense. It is not focused on simply making you the best marksman on a bullseye. Rather the goal is to help you quickly develop fundamental skills that you will actually apply in a real world worst case scenario. The coursework is based on information about how the body works under stress and what really happens during fights. The program features a variety of specialty drills and training methods that you will be able to utilize in your own practice after the course in order to continue to develop your skills. This course is two full days of essential training and practice. NOTE: The minimum age for open and concealed carry in Alabama is 18. If under 18, parent or legal guardian must sign waiver and be present during training. Only 10 spots available per course to maximize safety and quality of training. Be sure to sign up today to guarantee your spot! Please check our training calendar to see our other upcoming courses. You may also contact us to ask any questions or to host a course.